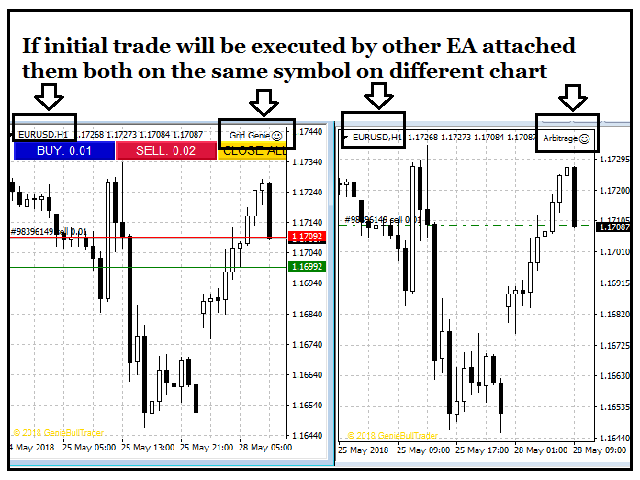 Executes a trade relative to the type and distance of the initial open trade, regardless if the initial trade was opened manually, by Trade Panel button, by other EA attached to the chart with the same symbol or if Built in first Trade parameter is set to true. Opens a initial buy trade if the previous daily candle is bullish and if last closed trade type is sell or none. Opens a initial Sell trade if the previous daily candle is bearish and if last closed trade type is buy or none. Lots Increment that sets a lot size with an increment of the value of Starting Lot. For example, the Starting Lot is 0.02; the next lot size of the same trade type will be 0.04, 0.06, 0.08 and so on. A Virtual Take Profit will be set definable in parameters relative to the buy average or sell average. Buy Trade will take profit if Bid Price is equal or cross above the Virtual Take Profit. Sell Trade will take profit if Ask Price is equal or cross Below the Virtual Take Profit. The Stop loss is based on percentage of balance that will cut all losses if the percentage you've set is reached. For example, you set 10% as your stop loss percentage. If your account balance is $1000, 10% of $1000 is equal to $100 and if the floating equity loss is above or equal to $100 all open trade will be closed. Trades on all types of pairs. The user has to be able to consider withdrawal as a part of the strategy. It works on all timeframes. I have already set the most optimal default parameters in accordance with the strategy. It has been developed while considering trading on a real account. Buy Button executes a buy trade. "No X Margin" will appear in the button label if not enough margin to open a buy trade. Sell Button executes a sell trade. "No X Margin" will appear in the button label if not enough margin to open a sell trade. 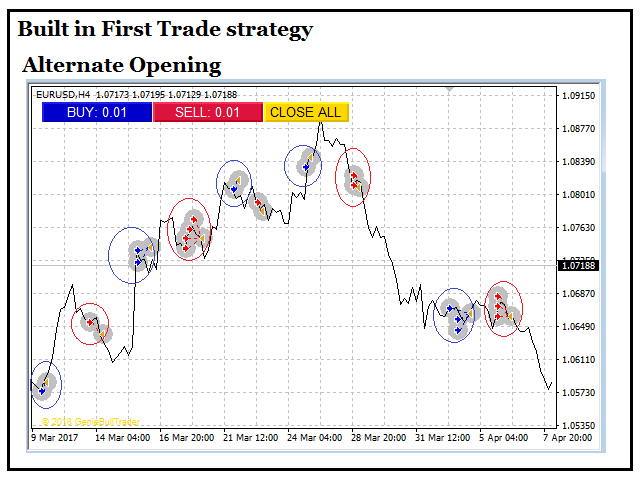 Close All Button closes all open trades with the same symbol in the whole MetaTrader 4 terminal. Average Buy Line computes the average price of long positions and visually draws it with a horizontal blue line. Average Sell Line computes the average price of Short positions and visually draws it with a horizontal Red line. Take Profit Line is drawn as a green line above the Average Buy Line and below the Average Sell Line. Built in first Trade - if set to true, the initial trade will open by the EA; set false to deactivate. Show Buttons - if set to true, Trade buttons will appear on the chart; set false to deactivate. MoneyManagement - Fixed lot, Lots Increment. Grid Distance Pips - sets the grid distance in pips relative to the last open trade type. Virtual Take Profit Pips - Sets Virtual Take Profit in pips. SL=__% of balance - set percentage of balance for stop loss. MaxOpenTrades - Sets the maximum open trade. I just purchased this EA and I love it!! It works as a utility with other EAs to open the first trade and then runs a grid and money management system that works awesome in my tests so far!! Removed the unnecessary alert if attached to the chart but the EA is not activated.